She would meet on the other side of the Edge today. Not near her herb garden, not near any place that she generally hid in. No. She would be strong and put herself out there. After all, today was not for teaching, today was for the announcements of the classes which would be taught and which the healers under the protection of the Moon would be required to attend. Should they wish to be able to help their herd they had to know specific things, and so they would be taught. Ruske had spoken of knowing first aid fairly well - having been a medic out on the battlefield and consistently healing wounded soldiers. Perhaps he would be willing to teach a first aid class for those nurses here who had yet to be graced with their own powers of healing. A gentle bob of her head meant that she agreed with that appointment for that class before she threw her cranium to the sky where Valiance was circling. Go grab our healers, Res commanded, and with a puff of smoke from his own maw he leapt to the sky once more and took off around the Edge to gather everyone who might possibly have the position of a healer in these ranks. And then, she allowed her voice to actually fall from her lips. "Aly, darling, come here please!" she does not say why, because it was better to be quiet about things until she was near. There was no need to shout about the meeting and possibly scare those around her. So, she would wait for Valiance to retrieve her healers and for Alysanne to join the fellow doctor so that they could decide what meetings they would be holding. Today… today would be good. @[Alysanne] first please then others. You have 1 week from when Alysanne posts in order to get your post in or you have no chance at being eligible to move up to a more skilled rank. Thank you! They had been just about to leave the Edge when Res’s voice drew Aly’s attention back into the forest. 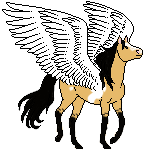 Or, well, they would have been on their way out if the pegasus had not been spending the better part of the morning trying to encourage Hemlock to leave the branch that he had settled on. He was awake, she knew, but he was pretending to not be interested - but if she were to leave without him, he would be upset! He was a fickle thing for someone so small and fluffy. Sighing, she shook her head at him - seeing that he was watching her through small little slits under his eyelids - and set off to find the sweet, golden-eyed doctor. She would not keep her waiting for long, picking up a quick pace to bring them closer faster. There is worry, of course, though the voice that called for her had been soft and without panic. Still, still she wanted to make sure that everything was alright. And sure enough, a quick (and not very subtle) glance confirmed that nothing looked out of the ordinary. So her classic smile brightened up her features - those green eyes shining as she came to a stop before her friend. “Res, sweetie! How are you?” Hemlock arrived then, circling the pair and hooting a greeting to the doctor before landing on his bonded’s head. She would have to remember for next time that just leaving could do the trick! After rolling her eyes good-naturedly, her attention returned entirely to the mare before her as she wondered what could possibly be the reason for the call. With the herd meeting finally being over the grey was walking back towards where she had been tending to stay with her boys when Valiance had found them. It was a little surprising to the mare for Res to be calling a meeting so close after the herd one had just come to a close. Regardless of the timing she knew that she needed to be there but since she had no time to track down anyone to watch Aeolus and Levex they would be needing to come with her. Hopefully their manners would keep up a little longer and they wouldn't cause any trouble.Turning her head down to her colts as they followed her back eager to play around again she spoke kindly. "Looks like we have another meeting to go to. It shouldn't be too long though please try and be good. You both did well before." She could see the excitement bubble up and simmer in her colts eyes as the thought of another boring adult talk but they only sighed in protest. Nudging them affectionately she proceeded to head in the direction that Valiance had indicated with her twins following reluctantly. Spotting Resplendence and Alysanne her spirits lifted joyfully after such a serious herd meeting. Nickering warmly to them she joined them reaching her muzzle out to Aly as per their usual greeting. Both Aeolus and Levex eyed the other mares with curiosity before slinking up closer to see what was going on. " Res, Aly its good to see you both again!" She commented brightly before turning her head to nip at Levex who decided it would be more fun to antagonize his brother into playing. As they once again settled down she turned her attention back to their small group wondering what was going on. She debated on asking what it was that brought them here today but decided it would be better to just let Res speak when she was ready. Hopefully they didn't mind her bratty colts having to tag along to the meeting, as long as they behaved that is. He was little more than a brief glimmer in the sky – red light flashing overhead. I lifted my head in surprise to follow the movement. Valiance. Did he need something? I peered up at the dragon, reading haste in his movements but no fear. He seemed to indicate a northerly direction before departing. I could not fathom his true purpose, but my hooves began to move without delay. Surely Resplendence had some use for me... I wondered what it might be as I walked, but only mildly. I would learn soon enough. I found them gathered in a random corner of the Edge: Resplendence, Alysanne, and Brisa. Something in me warmed at the sight of those – dare I call them friends? A hoarse whicker began in my throat and rumbled outward, the most pleasant greeting I could muster. Kind, brilliant creatures, all of them. I felt almost comfortable alongside such beings. Thus, with a brief nod of my head I continued my greeting, pausing first to blink at the small creatures tagging near Brisa’s side. Foals – well, it was the season for that kind of thing. I thought briefly of Faeanne, but shook the concern off as quickly as it had come. She would be fine away from my side for a brief while. I was not... I had no reason to drag her along everywhere, as Aurelia had done. Twisting my face into what I hoped was a friendly expression, I cocked an eye at Brisa’s little ones, instead. “Congratulations. They look quite healthy.” With a glance at the mare I added, “And you as well, Brisa.” That was polite enough, wasn’t it? I shifted my attention to the moon doctors afterward. The reason for my presence seemed pointed enough, with the two of them gathered – a healer’s meeting. Well, perhaps it would at least be brief. “Resplendence. Alysanne. What have you called us for?” Perhaps that was a little brusque, but I only had so much courtesy in me – and anyway, I had only just endured a tedious and entirely wasteful meeting for Kahlua’s benefit. I glanced about the clearing with a sharp eye, wondering how many others would come, and how soon. back in the edge, she talks to no one. she had attended the meeting but had been all too fearful to talk to anyone. she simply moves along in silence, ignored by the rest of her herd. she felt so alone despite being surrounded by those in her herd. only LIOR was there to aid her, to keep her sane. she liked listening to his childish words, that flowed quietly through her mind, swirling in bubbles through her wreck of a head. he was soothing to her, with his little phrases and bad grammar. it made her smile, which was a rare case for her. walking along in the edge, there is silence between her and LIOR. she hangs her head low, afraid to look into the eyes of anyone she runs across. she was an anti social being, one that was not fond of chatting about herd gossip or having conversations with strangers. this caused her to have few known acquaintances, the rest simply strangers that walk beside her in this herd. she acknowledges them, but does not speak to them nor make direct eye contact with them. a red flash in the sky and she looks up, spotting a dragon familiar to her. did this dragon belong to someone? was it not the head healer, the one she was learning from? perking her fragile auds, she follows the dragon to the gathering place of the other healers, eyes widening as she spots a mare and her children. her body trembles as she steps closer, eyes laid upon the dark stud and the two babes. she felt her knees grow weak, and her heart skip beats. she glances at RESPLENDENCE, wondering why she was allowing such creatures to learn from her. she did not find this to be okay, to have a stallion and two children attending a healer's gathering? she shakes her head, looking towards the black and white mare, whom the dark stallion called ALYSANNE. stepping forward she looks to the two mares, murmuring in her soft tones,"present." she sinks back, still tense as she eyes the alabaster mare and her children. they were untrustworthy, the dam and her babes. she could not trust the stallion either, he could be hiding his murderous intent behind a few kind, clever words and a smile. it seems that that is what they're best at. sidestepping away from the dangers, LIOR screeches at them, ruffling his wings as her discontent becomes his, and she glances at him, an ear flicking back at his dark, ruffled feathers. he settles down and in her mind she hears his voice, still young and words scrambled. they no hurt you now! no hurt! he screeches at her, sending confusion running through her. she did not quite understand what he meant, but assumed it was something along the lines of that is what he told them, that they cannot hurt or kill her. she offers him a thank you, soft and delicate through their tie before returning to silence. It was during her nap that the call came. She was hip to chest with Ktulu, the mare's neck comfortably resting over her hips, and her own cheek pressed to the Constrictor's flank. Eyelids fluttered, only to sink back into silent slumber. Aodaun was the only one awake and alert, as he often was when his bonded slipped into unconsciousness. It was the crimson dragon that caught his lime eyes, and though he was reluctant to awaken the slumbering Poisoner, he knew she would be more upset to have slept past a meeting that required her. Reaching out with gentle, urging fingers of consciousness into her mind, he roused her from her sleep. Glistening lavender eyes peered out at him, framed by long ebony lashes as she blinked slowly at her bonded. Sighing, warm and sweet against her mate's skin, she gently shook herself until Ktulu removed herself from her frame. "The Doctors need me," she explained softly. Turning towards the call, she left a lingering touch upon her mate's cheek before calling Aodaun to her heel and setting off towards the meeting. Shaking the sleep from her limbs with a light jog, she was one of the last to arrive from her reasonably certain guessing. It didn't bother her, she would be late to every meeting if it meant a few more minutes sleeping with her beloved in peaceful silence. Aodaun snorted softly, staring at one of the younger mares who seemed about ready to jump out of her skin, as if she were wary of all those at the meeting. Lakota rolled her eyes to herself and strode gracefully to the front where her little kitten was waiting with Alysanne. "Hello again, kitten," she cooed, smiling lightly as she cocked a hip and let her tresses curl around her ankle. Lakota managed to conceal her jerk of surprise at Aodaun's outburst in her head, turning to let her gaze fall upon Brisa's babies. Her heart soared and her smile brightened considerably as she tried to restrain herself from running over. She at least managed a walk. "Brisa, they're beautiful! I saw them at the meeting...oh, you'll simply have to let me watch over them some time!" She gushed quietly, trying to hide the fact that Lakota the Poisoner actually had a soft spot for foals. It was simply blasphemous. She had a reputation to uphold! She lowered her tiara to the twins, smiling gently, orange clay beads clicking an entrancing melody as her mane shifted. "What are your names, little ones? I'm Lakota." Careful not to draw attention to herself. It was a meeting after all, and business would likely occur sooner rather than later. Nayati flicked an ear and gazed up to where her dragon was excitedly circling overhead, his childish speech piercing in her mind. Laughing, she shook her head, baubles clinking musically in her mane as she chided him aloud. "Rath, stop bothering Valiance, he's collecting us." A pouty feeling swept over her and she rolled crimson eyes, amused. Nevertheless he obeyed her, sweeping down and away from the younger red dragon and back to her spine to alight upon her skin with a prickle of claws. It was clearly Resplendence who called for them, and where Resplendence was Alysanne was sure to be. While Nayati had grown much in the past few seasons, she was not quite brave enough to face a group that did not consist of at least one of those two mares. Knowing they would both be present, as well as in charge, comforted her enough to inspire her presence. She had no real talents in her opinion, but doing nothing was bothersome and she felt as if she were a burden upon her herd. Nameless as she was to those around her, she would rather be helpful and nameless than anything less. Sighing softly she turned to where the other dragon had come from, Rathunax cooing softly in his unique way before lifting off into the sky to scout ahead of her, as if there could possibly be any danger in the herdland. Tresses slid upon the ground, a trail of snow decorated with splashes of colorful flowers that sprawled out behind her as a mark of her passing. Despite her lateness, she made no scene as she entered the meeting. It was easy for the spotted mare to go by unnoticed, but she bowed her head shyly to the two mares she cherished in greeting and acknowledgement. Rathunax circled above the meeting for a few moments, clearly judgmental of those gathered aside from the two who treated his bonded with love and respect, but Nayati called him down in time and he crawled upon her hips glaring fire and brimstone at everybody else while the maiden rolled her eyes. She was quite used to his behavior. And while no words fell from her lips, not knowing what to say or who to direct those words to, her aurals were attentive and mind prepared for whatever was to be spoken. The meeting had ended and the winged beast wandered off quickly, the fluffy black zephyr cheeping her demands at him. But he isn't annoyed. In truth and fairness, their bond had deepened quickly and her hunger had become his hunger. The empty pangs in her stomach echoed from her soul to his and though the meeting had lasted longer than he had been expecting (he had, after all, missed so much by remaining in the caves as long as he had), he knows that her need isn't one of desperation. It isn't of life or death but it is a nagging need all the same. With the small bird riding in her nest of mane and feathers at the base of his neck, he weaves through the trees of the Edge seeking the secluded spot they found last time with the berry bushes and plentiful insects. After only a few moments, he arrived in their little clearing. Lowering himself to the ground, Eliana hopped and slid off his back to the ground. The small, fluffy bird-like creature hops about and eats to her heart's content. Meanwhile, the pegasus hasn't budged. Instead, he simply lays there and nibbles lightly at the grass - thoroughly enjoying their time together. In truth, she was a highly welcome distraction from Aly. His love for Aly hadn't truly diminished and every piece of him yearned for her but he had a zephyr now. Eliana loved him, and he loved her. But it was a different love. It wasn't a romantic love but it was deep nonetheless. In certain ways it was deeper still than his love for the black and white pegasus. Eliana was the other half of his soul. Little Ellie. The young zephyr - still so fresh, new, and covered with black fluff - finished quickly, hopped back to Miykael's side and as he reached around, he lowered his muzzle to give her a boost back up to her cozy space at the base of his neck. Just as he is about to rise once more, a streak of red catches his attention. He turns his head, glancing in the direction the red figure had gone - he quickly realized it was a red dragon. At first, Miykael couldn't quite place the dragon. Whose was it? Did it want him to follow him or go somewhere? After a moment, it all fell into place. Resplendence. This was the red dragon with the Mood Doctor at the herd meeting. The petite mare must be calling a meeting, then. With a small smile and Eliana settled into the thick black mane and white feathers at the base of his neck, he sets off in the direction that the red dragon had subtlety indicated. It has been taking him longer to get places since Eliana hatched. Predominantly because he is afraid to fly with her upon his back and with her so young he is terrified of leaving her anywhere alone. His wings ache to feel the wind caressing his feathers but the newborn zephyr means more to him and so he walks. Moments pass and soon he can see the claybank dun at the heart of the group. He is the last to arrive, it seems. Moving forward to join them, he pulls in near the back so as to, hopefully, remain inconspicuous. The pegasus remains silent, only dipping his head in respect once Resplendence turns her gaze to him. His vivid blue eyes, and attention, drift then - finding the vibrant emerald green of Aly's eyes. Pain stabs his heart, causing Eliana to chirp - partially in sorrow and partially in concern for her bonded. Exhaling a sigh, he returns his attention to Resplendence - waiting for the meeting to begin. As Aly arrived, asking how she was doing Res managed one of her meek smiles. "Good, though we must speak with our healers - I have some ideas..." she explained, shuffling her weight a little bit as the sight of a grey mare and her two foals slid into view. A smile graced Brisa's face as she called her greeting and pulled up near them. Though, before she could speak, another pulled up. This time it was the gruff form of Ruske who appeared, asking to see what it was they had been called for. Alas, it was the glass form of Ayelet, whom Res had met in the caves but once, who arrived next only offering the word of 'present' before sidestepping away towards her own place. And then, it was the blue-tinted mare who had saved her herb box in the caves. The familiar name of kitten sliding from her lips in a coo-like sound and a smile upon her maw. Gentle eyes meet the mare's gaze for a moment or two before she offers a bob of her head in greeting until her eyes fall upon Nayati. The sweet one only bowed her head as Valiance came swirling back towards Res and landing upon her withers in a swift movement. But it was not just Valiance who returned but the other paint who had stuck by Alysanne's side during the darkness - who had changed because her magic was unable to protect them. Gently, she cleared her throat. Quiet voice trilled out into the air and floated around all of them. "This meeting will be quick, for I know that many are already tired from the other meeting. However, we need to bring a few things forth - to your attention. I wish to find ways to expand everyone's knowledge, and so I hope that each session we can hold about three classes to not only teach each other but fellow members of our herd and even our allies once we gain them. I will offer a class on the herbs which help to deal with mental illnesses and stress. Ruske has offered to teach first aid earlier, and I hope that he will be willing to do so soon. If you are willing to teach something, anything, please do let me know and we can try and get you in on these next seasons. Alysanne has basic herb knowledge for a few herbs that have multiple uses - if she would be willing to teach that, then we should be set for this season. Once you have attended five different classes and can show your knowledge from these classes you will have the chance to move up from an Acolyte to a Skilled Nurse." There is a light pause, as her uncertainty shuffles around and she grabs her bearings again. "I hope that we will also be able to spread some of this knowledge to our warriors - to aid them until someone can get to them to really help them. We would also love to hear your ideas on things which we can do. And, I hope to send a few of you out each season - with a warrior or another healer - to collect some herbs for our supply." With that, she stopped speaking, allowing her eyes to scan the crowd and see what their thoughts were. It was time the healers got a chance to learn - to spread the knowledge and assist in healing all of those which they could. For the Edge was their family, and the family must find ways to protect and save itself…. As the others slowly arrived one by one the grey realized that they had a lot more healers than she had expected. It was good to see so many that shared the same interest in helping others and caring for them. It gave her a warm sense that she was a part of something for a change, she had knowledge that not everyone knew about, her and her friends were in a way special and depending who you talked to they were also talented! While the feeling was normally one that you would get to experience as a yearling she had lived a rather deprived childhood, maybe that just proved she was younger than she felt with her twins tagging along with her. Might not look it but it was the feeling that counted and she was thoroughly enjoying it. Ruske was the next to arrive offering her kind words and a smile as he greeted everyone. Smiling in response she nodded in acknowledgement grateful for his kindness, while she had only met him one other time she was beginning to like him more each time they spoke. She could see him potentially becoming a good friend with time. The mare that arrived next was quite stunning, a stranger still but she seemed a little skittish and horrified perhaps? A little strange but she knew nothing of the mare to judge her behaviour so she just smiled warmly as her eyes met hers for a brief moment. The next face was thankfully one that she recognized and was happy to see here with them, Lakota was a wonderful girl and had always been so kind. Wickering softly to greet her a smile lit up her face as she listened to the compliment that she offered her babies. " Thank you! Feel free to watch them whenever you would like, Ktulu and you are more than welcome to come visit them anytime." She commented softly gazing back to where Aeolus and Levex were slowly moving towards Lakota in curiosity. Both colts were getting much braver than they were to where they would actually approach others now instead of hiding behind her. Reaching out her muzzle to them she lipped at their short forelocks affectionately chuckling as they tried to avoid it with a shake of their heads. "My name Aeolus." Surprised by his response she smiled in approval as Aeolus started to become more comfortable with Lakota. Flicking his short tail playfully he turned back with his bright blue eyes shining, to his brother as if to say well come on what are you waiting for. "Levex." He finally commented shyly looking up to them with two toned orbs. Looking up to the rest to be sure that she had not missed anything two other bodies had appeared, one familiar and one strange. As Res started to speak she listened as she explained the reason she had called them all here and what she had in mind. Res had mentioned the classes before so this was no surprise to the grey it was actually a good idea for everyone. " I can help however I can." She commented lightly trying to think of what she might be able to contribute. Well she could possibly teach others about some of the different combination herbs good for healing and poultices, they would be of use to warriors. It might be harder for her to take on teaching a class unless she was able to find a babysitter for her two munchkins. They were pretty good but classes would take more time than they would likely stay patient for, unless she could try and get them to help her in some kind of demonstration to occupy their time. This would take some planning for sure. staying towards the back of the gathered healers, she remains with lips sealed. eyes flicker, jumping from equine to equine, few familiar faces found in the crowd. in a sea of strangers, she bobs her head gently, eyes bounding to resplendence as she speaks, speaking of skilled ranks and teaching classes. gentle flickers of interest in lilac eyes, auds reaching forth and lips parting to offer her own words. "i... i can offer services. classes—" hesitant to continue she flicks back an ear. "i can faintly recall potions, poultices, and some herds and uses—" voice fades, swept away in the wind to naught but a faint murmur. she sinks back, looking at the laced mare with her brows swept up. she had begun to fret, afraid of being judged or mocked, afraid to be shot down by those gathered around her. remaining behind everyone, she searches the crowd, taking note of the faces she runs across. 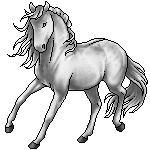 a white mare and her children are gathered before her, transparent bodice shifting away from them, cautious violet eyes befalling the children. a young doe of brown and white accompanied by a red lizard that perches upon her quarters, looking out across the gathered with fire in his eyes. she shies away from his gaze, ears falling back. the dark stallion had already been recognized, spotted and avoided. she shifted her gaze from him, laying eyes upon the winged mare of night and day, snow and storm. wings of white laid out upon her barrel, beautiful and graceful. the youthful beaut had a fascination with those who held wings, who could soar through the skies, touch the heavens and yet return to the world below. she did not understand why they returned time and time again to the surface of the earth, where they walk among those earth bound. 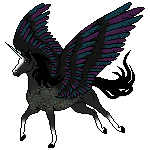 if she was granted flight, she would not waste her gift, she would never let her hooves touch down upon the ground, never would she tie herself down to the earth. she would stay in the clouds, tuck herself away into the heavens and become an angel.